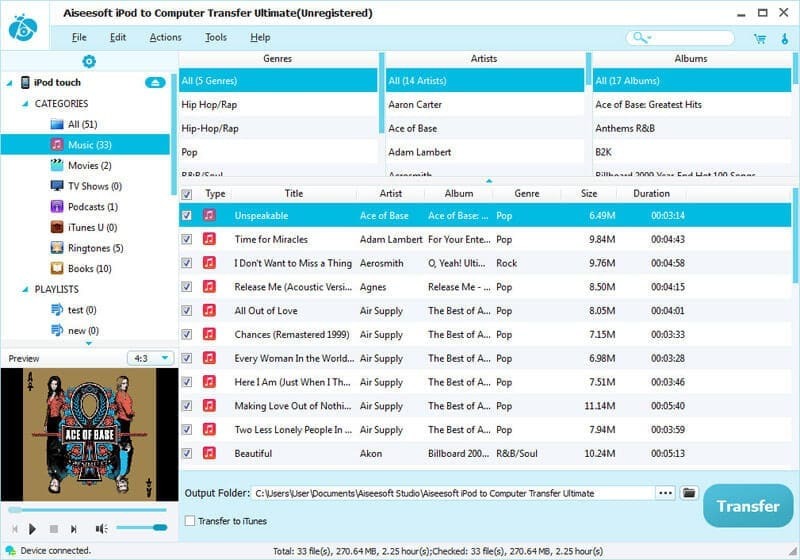 Aiseesoft iPod to Computer Transfer Ultimate is specially designed for iPod users to backup all iPod files, including music, movies, pictures, TV shows, podcast, iTunes U, ePub, PDF, audio books, camera roll, voice memos, and camera shot to computer or iTunes. And it also can be used to transfer your iPhone SMS(MMS) and Contacts to computer (Ultimate version). Moreover, it also works well with the latest iOS7 Apple devices, including iPhone 5s/iPhone 5c, iPad Air and iPad mini 2. Aiseesoft iPod to Computer Transfer Ultimate can help iPod users export all iPod files, including music, songs, ringtones, movies, pictures, TV shows, podcast, iTunes U, ePub, PDF, audio books, camera roll, voice memos, and camera shot, to computer or iTunes without any loss. This iPod Transfer can also help users transfer iPhone SMS to PC as .txt files, backup the iPhone MMS to PC as video, audio or image files, and copy all Contacts or a specific Contact to PC as .vcf files. Also it allows you to backup your iPhone SMS (MMS) and Contacts on this program. This iPod to PC Transfer is highly compatible with: iPod 3G, iPod 4G, iPod classic, iPod mini, iPod nano 7,iPod shuffle 4, iPod touch, iPod touch 5, iPod Video, iPhone 5s/5c, iPhone 5, iPhone 4S, iPhone 4, iPad Air, iPad mini 2, iPad mini, iPad 4 and so on. Once you connect your iPod to computer, all iPod info, including picture, type, capacity, version number, serial number, and format, will be clearly shown on the main interface. Aiseesoft iPod to Computer Transfer will auto-scan your iPod files, and sort these files by Name/Album/Artist/Genre, and then you can find your files more easily.